Ranjish.com has lots of Urdu Kishwar Naheed Poetry. Feel free to add your own Kishwar Naheed Shayari here. Kishwar Naheed is a Sitara-e-Imtiaz winning poetess from Pakistan. Her most popular poem ” We Sinful Women” was a ground breaking hit all over the world. Find Kishwar Naheed poetry right here at Ranjish.com . 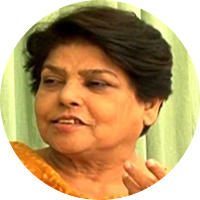 We update our poetry database on daily basis so keep coming back for more Kishwar Naheed.